The biggest news on the app front is that OnScreen Science’s second iPhone app, OnScreen QB Stats, an app for recording, calculating, and reviewing the passing statistics of quarterbacks during and after football games, is now available on the iTunes App Store. I’ll devote another post to that soon, maybe tomorrow, but I want to catch up here on app number one, OnScreen Pitch Count. OnScreen Pitch Count went on sale from the iTunes Apps Store August 26. I won’t go into the details of the typo I had in the press release I sent out or dwell on how the video I posted to show the app in action worked fine on a Mac or Windows PC, but not an iPhone. That’s all in the distant past, fixed and forgotten. Once the app had made it to the iTunes App Store, I was looking to find reviewers for it to help get the word out. I’d had magazine reviews of my science education software in the past, all of them quite favorable (a four-star Macworld review of OnScreen Particle Physics caused a major uptick in sales years ago), but not in a long time and never, of course, for an iPhone app. My number one hope was that the Macworld web site would post a review. As luck would have it, Macworld had not long ago reviewed another pitch count app. That showed they had someone sufficiently interested and knowledgeable to do a review, but it might also make it less likely they’d want to devote space to another example in this little niche, even one that was better than the first, especially so late in the baseball season. Apple provides every developer of an app forty “promo codes” for the free downloading of each new app or update. I sent a promo code with a review request to the email address of the Macworld reviewer, but never got so much as an acknowledgement. I hadn’t counted on a Macworld review anyway and had found other iPhone review sites (a good number of which are devoted solely to games) and approached a few of them. One or two review sites responded with the suggestion that I expedite a review by paying them. That I wasn’t about to do, and I wouldn’t really trust their reviews after knowing how they operate. A couple of reviewers took the trouble to download the app, test it thoroughly, and write a review of it, for which I am grateful. The two iPhone app review sites that reviewed OnScreen Pitch Count were AppGirlReviews and JustAnotherMobileMonday (JAMM). I ran across the AppGirl on Twitter, and she was happy to take on the review (actually to pass it on to someone on her staff). I learned of the JAMM site via Google. 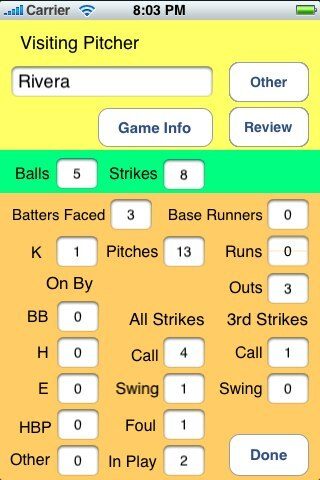 JAMM had reviewed iScore, a baseball scorebook app, for the iPhone. This review showed the reviewer to be a baseball fan who liked to keep score during a game, which I thought, correctly as it turned out, made him a good candidate to review OnScreen Pitch Count. Even though I felt the app was solid, and it had passed Apple’s review, I still felt some anxiety over the possibility, however unlikely, that a reviewer would uncover a crashing or data-scrambling bug. On that score I was quite relieved, as both reviewers had nothing but good experiences to report. There was plenty of agreement on the performance and power of the app and its ease of use, really, despite complaints about interface. The JAMM reviewer in particular disliked its looks, and I can’t blame him. I had used Apple’s Interface Builder’s oddly minimalist, totally two-dimensional rounded-rect default buttons for the interface. My hope was that someone wanting to track a kid’s pitches wouldn’t be totally repelled by the looks, and I didn’t want to delay the app’s launch any more than I had to. Of course an unappealing interface can indicate overall lack of care, which by assumption might carry over to the actual functioning of the app. Fortunately, the reviewers used the app enough to see how well it worked. The JAMM reviewer couldn’t stand the app’s looks, but acknowledged that “like the story of the Ugly Duckling, there really is a fantastic and robust app hidden inside there.” In addition to general aesthetic objections, he wanted a more graphical interface (instead of labeled buttons presumably), but I confess I don’t know how to come up with something that would convey “ball” as well as the word. And so on. A great deal of experimentation went into button placement in fact during development. For opposite reasons, which is interesting, both reviewers emphasized the limited market for OnScreen Pitch Count. The (male) AppGirl reviewer, in particular, seemed downright offended that I suggested in the app’s description that a normal fan might enjoy tracking pitches in a game he or she was watching. My claim was based on my own experience in testing the app, but the reviewer really took exception to the idea, noting that nonetheless he would let it pass and only report on how the app functioned. That is basically what he did, and he had plenty of good things to say, recommending it without qualification for coaches and parents of pitchers. But in closing he came back to say that otherwise it was of interest only to “fanatics,” and that it was “burdensome” to record pitch results. Despite all the positive things he’d said in the middle of the review (the only serious complaint was lack of email capability, which he thought was a “glaring” defect), he gave the app a mediocre numerical score. The JAMM reviewer, on the other hand, felt the app would be of limited interest because a regular (not a fanatical) baseball fan wants to record much more than pitching data, as in a full scoring of batting and baserunning results. Clearly there is a wide range of fan interest in keeping personal track of what’s happening in a baseball game, from nothing to everything. I still think there are some that may want pitching stats in particular, since pitching is so important, especially when it comes to managers’ decisions. I was so happy that both reviewers (real world people I’d never met) had found the app to work perfectly and to be of great potential use to its primary audience that I didn’t let any negative comments bother me. Really. A little after the reviews appeared someone posted a user review on the iTunes App Store, which gave OnScreen Pitch Count five stars, but also mentioned the need for email. My first update would add email. This update (version 1.1) was approved and posted for sale on the iTunes App Store on September 17. After the update had been posted, I noticed the iTunes summary said that iPhone OS 3 was required for my app. Since I had gone to quite a bit of work (following Apple’s guidelines faithfully) to use the improved emailing capability of version 3, while providing downward compatibility with OS 2.2 (through use of weak binding and conditional execution, for the cognoscenti), I was not happy about this. My query to Apple was unanswered. I decided to live with it and move on to requiring OS 3 or greater for future updates. This affects iPhone customers almost not at all, but about half the iPod Touch users have yet to upgrade the OS, since they have to pay to do so. I recently discovered an iPhone developer discussion thread about this very problem of OS-requirement change as being due to an Apple bug. Another user rating led to version 1.2. 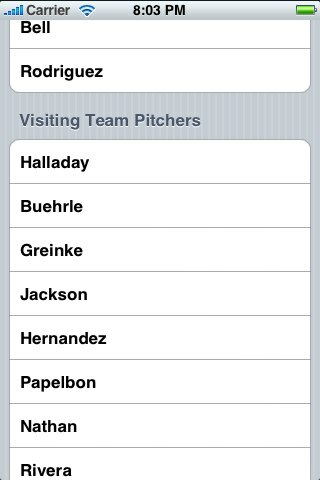 This user expressed the desire to see pitch results expressed in percentage form as well as total numbers. The update incorporating this new feature was posted for sale October 15. Finally, I addressed the ugliness issue and made the minimal, but significant, change to the use of better-looking buttons. The new buttons, while not photo-realistic, are pleasing I think, looking a bit like they’ve been rendered by colored pencil shading. Version 1.2.1 with the new look was approved as I wrote this. UPDATE: See also “OnScreen Pitch Count 1.3 Is Now on the iTunes App Store”. 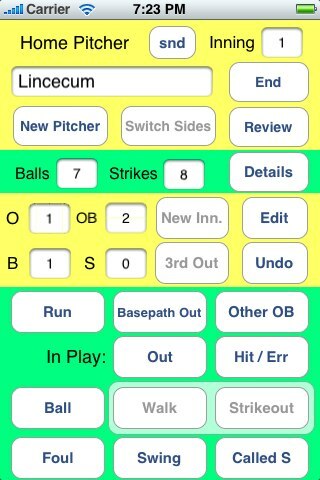 OnScreen Pitch Count Now On Sale on iTunes App Store! 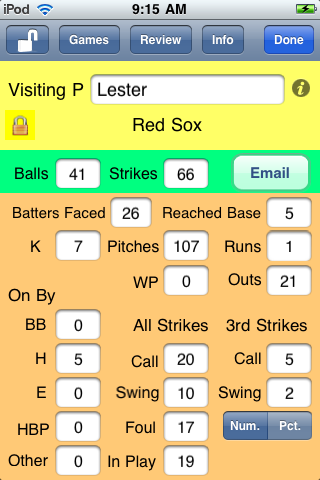 OnScreen Pitch Count, my iPhone “app” for recording pitch results in a baseball or softball game has been approved for placement on the iTunes App Store and is now available for purchase, in the Sports department, naturally. The past couple of posts here (OnScreen Pitch Count: An iPhone App Preview and How I Made a Quick-and-Dirty Six-Minute Demo Video of My iPhone App) have been devoted to describing the app and my efforts to get it ready. The only way to sell an app for the iPhone and iPod Touch is through the App Store, and Apple has to approve individually every app that goes on sale there. The estimated time for this approval had been quoted as about two weeks when I submitted OnScreen Pitch Count on the night of August 12. I hurried to get it done then because I was going to be out town for five days, visiting family. 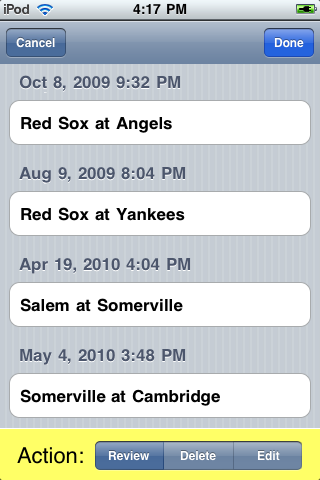 I spent the next couple of weeks wondering if I’d somehow introduced a fatal bug at the last minute (“impossible,” but still one thinks about the impossible sometimes) or if the reviewer at Apple might be someone that didn’t know the first thing about baseball. The evening of August 26 arrived, and OnScreen Pitch Count still hadn’t been approved. Then, almost two weeks to the hour since I’d submitted my app, I got the email saying it was now on sale on the iTunes app store. Sure enough, within an hour or so the link embedded in my email worked to take me to the OnScreen Particle app’s display on the iTunes App Store. Sure, it’s too late in the baseball season to make many sales now, but it’s still a good feeling to know the app has been approved. OnScreen Pitch Count from OnScreen Science, Inc. is an app for anyone wanting to have the pulse of a baseball or softball game at his or her fingertips. Pitching is the key to the game, and with OnScreen Pitch Count you’ll have data that even the tv analysts don’t. You’ll know how many pitches each pitcher in the game has thrown and exactly what the net results of those pitches have been. 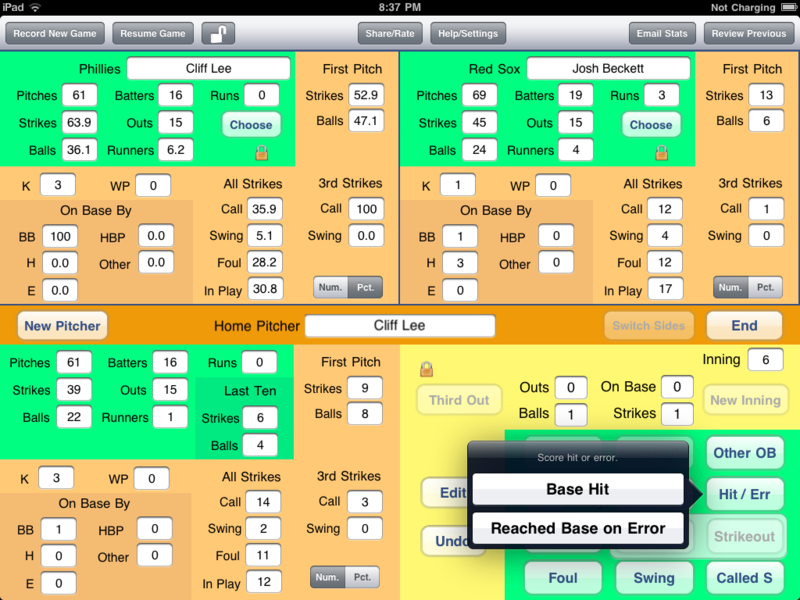 Whether you’re watching your favorite team play, listening to a game on the radio, sitting in the stands at your child’s Little League game, or coaching a game in which extra pitching data could help you make the right decision, you’ll find OnScreen Pitch Count enhances your enjoyment of the game as it increases your understanding of it. If you enjoy following baseball or softball, and especially if you coach it at any level, you should check OnScreen Pitch out. Even if you don’t really need it until next spring, you might as well get it and learn it now. I welcome comments and questions. See the email address in the right hand column. UPDATE: See also “IPhone App Updates and Experiences” and “OnScreen Pitch Count 1.3 Is Now on the iTunes App Store”.